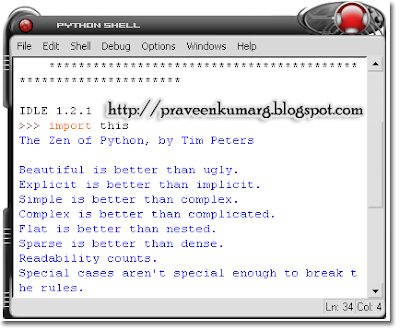 Python is a dynamic programming language that can be used for many kinds of software development. It offers strong support for integration with other languages and tools, comes with extensive standard libraries, and can be learned in a few days. Many Python programmers report substantial productivity gains and feel the language encourages the development of higher quality, more maintainable code. Python is Portable it runs on Windows, Linux/Unix, Mac OS X, OS/2, Amiga, Palm Handhelds, and Nokia mobile phones. Python has also been ported to the Java and .NET virtual machines. It will print Zen of python, design principles of Python.